There’s no number to text your vote for Coke and Ford, but the brands have fused themselves to Fox’s pop star machine. Here’s how. Tuesday night, on part one of the season finale of American Idol, Taio Cruz performed “Positive,” a song co-written by fans online and co-produced by Coca-Cola. 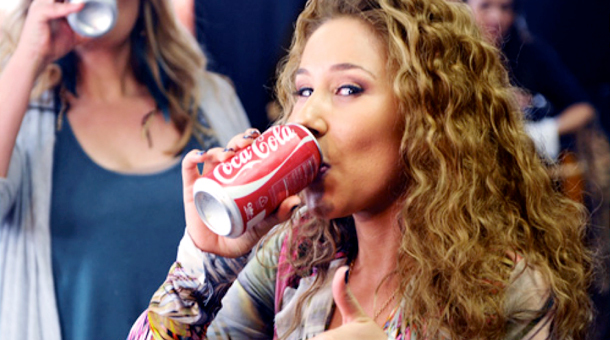 It’s part of Coke’s Perfect Harmony campaign, and the soda maker’s in the middle of its 125th anniversary. Wednesday night, Ford will present each of the final two contestants, Lauren Alaina and Scotty McCreery, with a Ford Focus for their favorite teacher–part of the automaker’s Drive One 4 UR School program. Somehow, none of it feels especially icky. To steal another product’s tagline for Ford, Coke, and American Idol: You’ve come a long way, baby. In the 10 seasons since Idol debuted, the Fox show has become a ratings powerhouse and a fertile training ground in nontraditional media-buying for Coca-Cola and Ford, two of the show’s three primary sponsors (AT&T is the third). As the DVR gained ground in the past 10 years and social media and product integration have taken over, Ford and Coca-Cola have used Idol as an incubator for branded content ideas, allowing the companies to create campaigns like the ones you’ll see tonight. From a viewer standpoint, the product placements don’t really stand out. Shilling feels like one of the skills a modern pop star must master, and Ford and Coke are happy to help wannabe Idols correct their pitches. None of this was a given nine years ago, when news of Fox debuting a singing competition summoned memories of Star Search and Solid Gold. It can be hard to recall TV before reality took over, and harder still to think back to when product placement on reality TV was new, a bit unseemly, and undeniably clunky. But try to remember 2002. Survivor, then in its second season, was a growing hit on CBS and featured product placements from Mountain Dew and Doritos. Fox was importing Britain’s hit Pop Idol in the form of American Idol, hosted by two unknowns, Brian Dunkleman (what happened to him?) and Ryan Seacrest. When it came on the air, the show’s judges would enter the theater riding in the new Ford Focus–for no reason but shameless (and clunky) pluggery. In addition to providing the cars out of which Randy, Paula, and Simon would awkwardly step, Ford slapped its logo all over the Idol set. “It’s not the easiest thing to correlate with cars,” concedes Crystal Worthem, Brand Content and Alliances Manager for Ford. While Ford had the challenge of figuring out how to make cars suit a singing show, Coca-Cola had it easier: The company put Coke cups on the desk in front of the judges. Voila! “The most fundamental thing we do is provide refreshment,” says Jed Selkowitz, Director of Entertainment Marketing, Coca-Cola North America. “It wasn’t gimmicky, it was truly organic.” Plus, Coke’s rich history with pop music, epitomized by 1970s jingles like “I’d Like to Buy the World a Coke,” which conveyed the product’s core message about hope and sharing uplifting times, sums up what Idol is for families at home. At the end of Season One, Ford found its Idol integration footing with the show’s first Ford commercial/music video, in which the contestants drove a Ford and sang. “That was our ‘A-ha!’ moment,” Worthem says “We thought, that could be a cool way for contestants to display what’s best about them, and for Ford to display what’s best about us.” Ford had hit on a formula that not only showed off its cars, but let the audience see the contestants play dress-up and have their first experiences as pop stars, making real music videos–and endorsing products, a lucrative part of the modern pop star drill. And yet, the cheesy, hard sell is somehow Idol’s stock in trade. Low points include Season Seven’s Love Guru promotion with Mike Meyers and Jim Carrey’s unfortunate appearance in an elephant costume, promoting Horton Hears a Who. Just last week, Idol featured a forced segment in which director J. J. Abrams stopping by to show the contestants scenes from his upcoming Paramount movie, Super 8, starring Elle Fanning, who shared with Seacrest her 6-year-old cousin’s Idol pick. It could have something to do with the fact that viewers are in the mood to be pitched to–by contestants begging for their votes or soft drinks and automobiles begging for their dollars.